The Touch Tunes jukebox is super fun! It gives you the you-pick-you-choose, old school music-playing-ability in a completely modern and digital way. 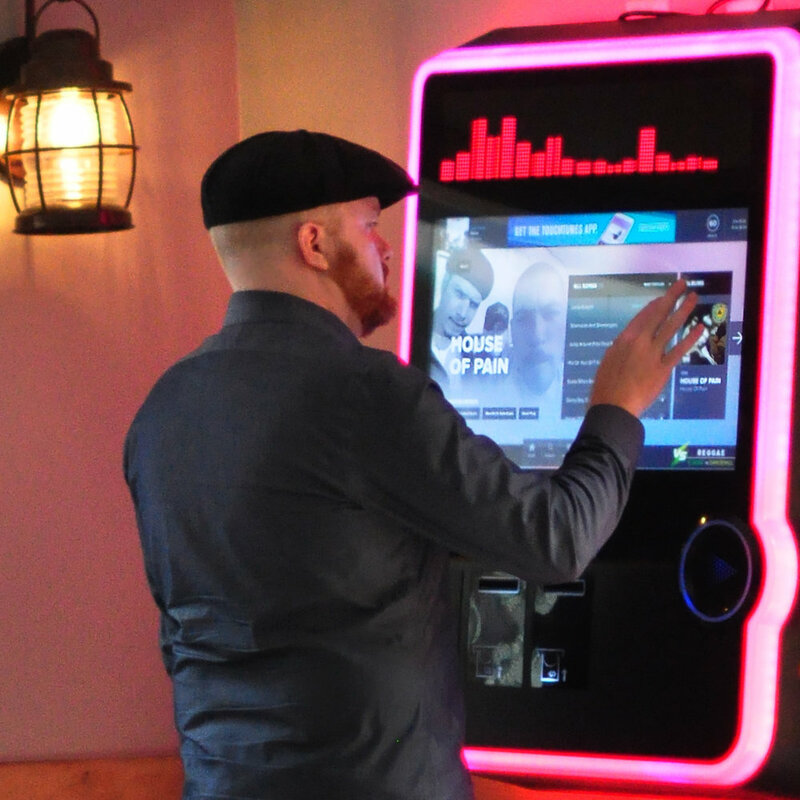 If you see a Touch Tunes jukebox mounted on a wall in a bar -like we have in ours- you can walk right up to it, insert a few dollars and play a few songs. It's that easy. 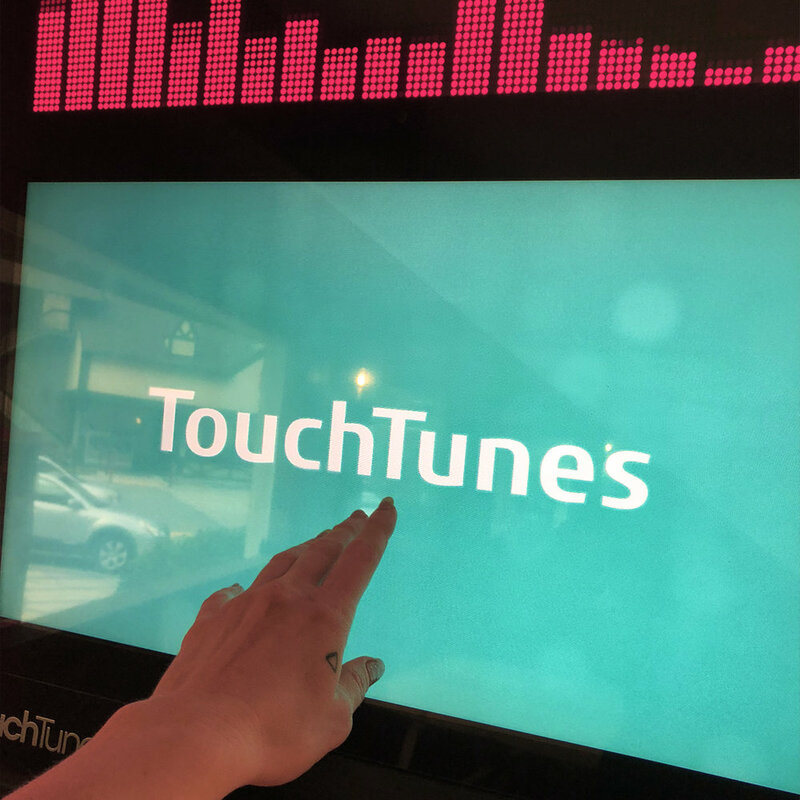 But what actually makes the Touch Tunes jukebox SUPER FUN is the mobile app that allows you to fully control the music right from your phone and be the DJ any time you want. You can DOWNLOAD IT HERE for free. When you download the Touch Tunes mobile app and create a quick account (via email or facebook or google) you have instant access to any song in the database to play at that very moment. You simply tap it and tap play or play. It's that simple. You even have the option to pull artists and songs from your personal playlists so you don't have to search for all your favorite songs in the app because they're already right there on your phone! However, if you don't want to use a pre-existing playlist, you can easily search and favorite songs so they're always easy to find, make a new playlist on Touch Tunes, create a set list and be the DJ for the next few songs... or for the entire night, if you so choose. What you also get through the app which you don't see on the real-time jukebox is the list of songs that are playing next and the ability to see when your songs are going to play. You can choose to "play next" for an extra credit if you just can't wait to hear your song NOW, OR just add it to the list and it will play as soon as the other songs in the queue are played through. The more songs you play over time, the more benefits you get - like being able to see more songs in the queue and earning free credits to play more songs! You can pay for credits easily via PayPal, ApplePay or any credit card and the app saves your song credits for your favorite locations so they're there each time you return and login. If you're a regular at Dogwood Tavern, or even if you come in once in a while, it's so much more fun to have all your favorite songs at your fingertips so that with just a few taps, you've set the mood and tone that you want any time you want it. Get the Touch Tunes mobile app NOW! OR you can keep it old school and use your legs and walk up to the jukebox to play your music the old fashioned way (like in the photos below).... Either way you get to be the DJ and hear all your favorite songs... it's just a little more fun when you can control it all from your phone.